Providence $70 5-course tasting menu anniversary tasting menu extended through July!!!! "What would you save in a fire?" is supposed to be one of those questions which prompts answers that reveal a lot about who you are and what's important to you. With the impending automotive doom (i.e. closure of a crazy busy 10-mile stretch of the 405 freeway between the 101 and 10 freeways July 15 10pm to July 18 5am) - endearingly named "Carmageddon" - nearly upon us here in Los Angeles, we find it is more than just a test of our patience but the very fiber of our being. All in the area find themselves asking what they are doing in anticipation of this, the unimaginable - and many preparing for it with the fervor of doomsday believers on the eve of the millenium. Some plan to stay home all weekend July 15-18 despite the siren call of the beach in thick of SoCal summer. Some lucky ones call the beach their home, in which case staying home is rapturous vs. apocalyptic. Neighborhood businesses are leveraging the locavore message and offering deals to attract customers in hopes of maintaining income over the dark period. Surrounding communities pull close, with friends and family hosting misfortunate weekend workers to save them a 'death march commute'; KCRW issues a plea for Santa Monica residents to 'host a displaced farmer'. Hotels offer "Carmageddon" specials. Some choose to flee the city altogether. Babies of all ages have started crying weeks in advance (myself included). Ok, so it's not really the end of the world. just an incredible inconvenience during what should have been a perfect summer weekend - that we will surely live through. But it is an event of great magnitude for a car-centric city, one to be reckoned with - and so we arrive at the big question: with so much at stake, what would you do in the face of Carmageddon? With June gloom thankfully a distant memory, I'm happy to be back to one of my favorite things to do on a bright Sunday morning (and one of the few things that will get me up early on weekends! ): strolling through Farmers Markets. Hollywood Farmers Market has been a favorite as of late, so thought I'd do a quick post that is sort of my free form, not really poetic, ode to 'TheHFM". 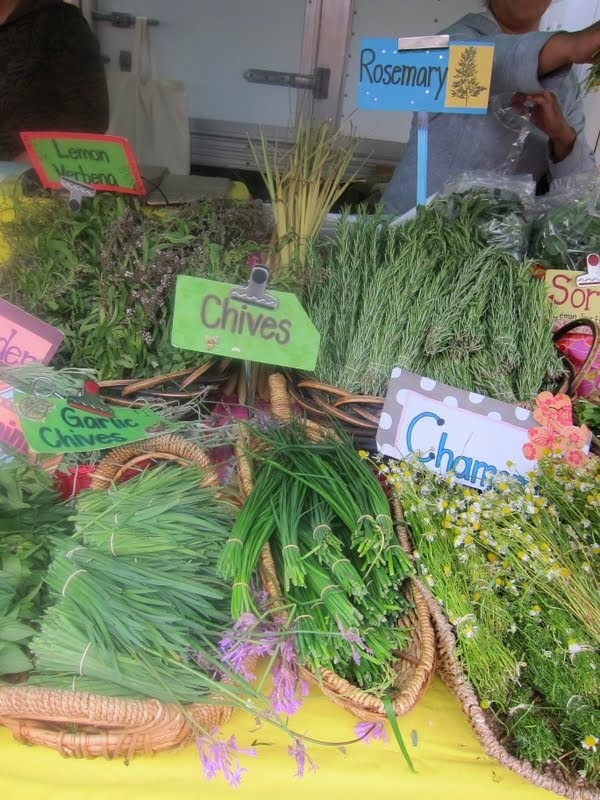 Four city blocks of tents filled with delicious discoveries: Farm fresh herbs at $1 a bunch (why does anyone buy those half dried out raggedy plastic trays of tiny sprigs at supermarkets anymore???)!!! 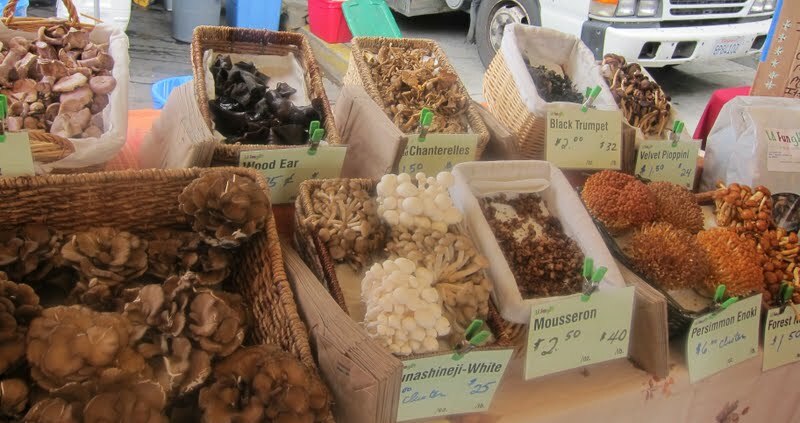 Mushrooms from LaFungHi, from the familiar to the exotic - everything from white button mushrooms to morels to enoki to wood ear to coral-reef-like-blooms with names I've never heard of. Weiser Farms potatoes (Providence uses potatoes from Weiser Farms!) Veggies / fruits / herbs that you won't usually find at the supermarket like squash blossoms, pluots, Japanese tomatoes (momotaro) that are less acidic, chamomile, fresh lavendar. Fresh caught seafood and grass-fed beef. Artisanal cheeses and fresh baked breads. Pro chefs go to the Wednesday Farmers Market in Santa Monica, so I know TheHFM doesn't have THE BEST selection - but I have a day job in the SFV and TheHFM has the best selection near me on a day that I can actually get to it! There's a great energy to the Hollywood Farmers Market, a sort of 'anything goes' vibe that in a way perfectly captures some of the essential flavors of LA. This isn't Malibu Farmers Market, where there's a very specific set of vendors and very specific target demographic. There are all kinds of entertainment including characters and personalities at TheHFM, and people watching is part of the fun. There's the Soledad Goat Cheese guy with his adorable and attention getting baby goats, the lady with leopard hair (just another shopper), the picture-perfect "Banana Republic graduate" couples with their preppy chic tots, the hip but not hipster musicians and actors, salt-of-the-earth type families, low key folks in their Sunday best uniform of shorts and flip flops, food paparazzi with their 600 pound SLRs, tourists with accents from all over the globe. All set to the backdrop of different types of live music on different blocks from reggae to jazz band to just guys with guitars doing their covers of the latest hits on the radio. LOVE it! Speaking of street scene - Hollywood Farmers Market has some fantastic, cheap and delicious street eats from Sri Windsor Cafe's Coconut Cake ($3 for 3) a pancake-like dough ball made with coconut milk, grilled fresh right at the tent and served in a tray made with banana leaf, sweet rice ($1 each), and their refreshing Thai iced tea ($2) to kebab plates to the tender, juicy chickens from Grillmaster's mobile rotisserie spit, which are also lined with roasted potatoes that capture all the luscious grilled chicken drippings. 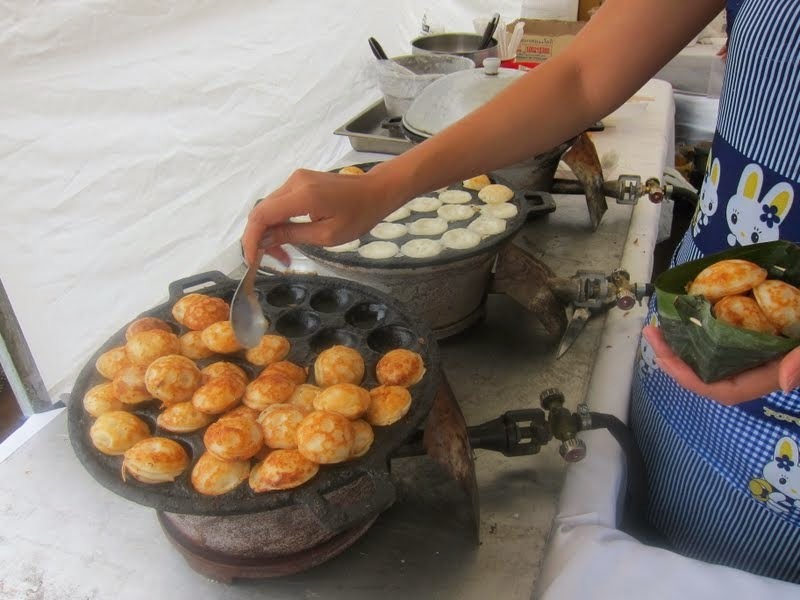 Every direction you go at the market, you are greeted by delicious sights and smells! 4. OYSTERS shucked to order!!! Only $2 each!!!! Just up the row from LaFungHi, there is an awesome stall called Farm Fresh Shellfish where they not only sell fresh shellfish including oysters at reasonable prices, they will also shuck them on the spot for you - if you are in the mood for brunch that is decadent only in taste - they are only $2 each!!! (Last time I went they had Fanny Bay and Endless Summer ones) There's a little table set up with lemons, cocktail sauce etc. if you're so inclined. I personally love the purity of oysters that taste untouched and only of deep ocean, so I'm happy to gulp them down whole right off the plate as soon as they're shucked - no toppings. It's rare for me to want to cook because I have a super stressful day job and don't have time or energy to cook, especially on weeknights - and weekends I usually want to get out and eat my way through town, as much as my wallet will allow, anyways! Plus, anything I make would be disappointing compared to the often life-altering experiences I can have eating what the pros dish out! But when strolling through TheHFM, I do find myself inspired by the ingredients to throw together rustic meals that I know will literally only take minutes to make but taste good (because the ingredients are incredible). Here's an example of one that I was inspired to make based on a $15 basket of mixed exotic mushrooms from LaFungHi. I basically adapted (i.e. grossly oversimplified) a recipe for Fettuccine with Wild Mushroom Sauce from Epicurious - I used half the recipe when just cooking for myself. The below makes about 2 servings depending on your appetite! Note: I am very particular with brands for some of my ingredients, but feel free of course to substitute with anything you like. Melt butter with olive oil in large deep skillet over medium heat. Add garlic and sauté until beginning to brown, about 3 minutes. Add fresh mushrooms; sprinkle with salt and pepper. Cover and cook until tender, stirring often, about 6 minutes. Uncover: sauté 2 minutes longer. Season with salt and pepper. Add fettucine to salted boiling water and cook for 3 minutes. Add cooked fettuccine and 1/2 cup cheese to mushroom sauce in skillet. Toss over medium heat until heated, cheese melts, and sauce coats pasta. Season to taste with salt and pepper. Transfer to large bowl and serve with more cheese as desired. Got any simple to make recipe recs for farmers market fare for me? Please do share! And maybe I'll see you guys around at TheHFM sometime! Parking: Street parking 1 hour meters on surrounding streets. Cahuenga seems easiest to find parking. Some meters free until 11am on Sundays - check parking enforcement signs. How many kids from 5th grade are you still friends with? Or even remember the full names of? Life-long bonds are rare to come by, and food loving residents of Studio City / the SFV are particularly appreciative of the friendship of Alon Raphael (owner of high-end family-owned namesake restaurant Raphael) with Chef Adam Horton (Saddle Peak Lodge, Test Kitchen), which dates back to Carpenter Elementary school, and which this year led to the talented chef's arrival to elevate not only the revamped eatery but the Valley fine dining scene. Gourmands both local and outside the SFV find themselves literally and immediately moved by the pair - straight to the chic, recently renovated space on Ventura Boulevard. First up was the Crispy pork belly “Panzanella” ($12) with house made French sausage, brioche, nước chấm, capsicum, herbs and pickles. This was essentially a great, decontructed Vietnamese banh mi sandwich - with tender pork belly that had a carefully balanced fat to meat ratio, and farm fresh, intoxicatingly fragrant herbs. The brioche could have had a lighter, fresher taste but we enjoyed the beautifully plated dish overall. Next up: Tuna Tartare ($13) with green curry “glass”, green papaya, coconut, kaffir lime, crispy taro, lemon grass, basil, cilantro. The name of the dish may be deceptively simple, but we knew from the inspired list of ingredients right below, that this was going to be anything but. This dish turned out to be probably the most inspired of the ones we had that night - tuna tartare reimagined with a vibrant, skillful mix of textures, colors and flavors celebrating the splendor of land and sea. Fatty chunks of raw bluefin tuna are counterbalanced by crunchy crystallized shards of green curry and light, crispy savory taro chips, which are in turn balanced by the overflowing greenery of fragrant herbs crowned by edible flowers. Kaffir lime adds clean citrus to cut through the sweet / savory flavors, while green papaya bridges the texture of the fish to other ingredients on the plate. Add to that orange dots of a sauce made with sriracha for a hint of heat on the side, and you've got a creative take on an otherwise ubiquitous dish that seems to evoke the ideal and vital beauty of nature itself. Steak Tartare ($15) hand-cut filet mignon, house-cured dill pickles, capers, with toasted brioche. I loved the smooth texture and rich flavors of the beef, but thought the mound was a bit overdressed with all the different toppings. I would have liked more room for the quality and natural flavors and textures of the beef itself to shine through. We could never find the will to turn down Diver Scallops ($15) - and Raphael serves theirs in a less formal style than the other dishes- on a bed of English pea, with black garlic sauce and uni reduction. The scallops were supple and subtly sweet, and absolutely lovely. Crunchy peas and soft brothy greens served as a nice balance to the scallops. However, as a big uni fan, it was a bit disappointing to find the uni was only in the reduction (when it is actual uni pieces - with plump texture combined with unique, briny taste that I love and had expected) . Our last savory dish was Mussels with Spanish chorizo ($15). Loved the clean saffron broth infused with meaty flavor. Sorry no pictures for this one, as it was getting dark by the time we got to this dish in our 5 hour dinner! Though we did not have any mains with this meal, I have definitely made a note to come back for the 48 hour steak with bacon onion jam. We barely had enough room for dessert, but were lured by the descriptions and decided to go first with the Broken Blueberry ($9)- a visual feast and sculptural feat made of panna cotta with beet ribbon (that looks like a translucent, gravity defying fruit rollup for grownups, but brittle) and berries. Will have to come back during daylight hours to get pics of this one! Followed by Banana Bread Pudding ($9) - with housemade peanut butter ice cream, peanut brittle and tempura bananas that tasted like perfectly ripened bananas fried in churro batter. I thought the tempura bananas were divine and actually preferred this to the bread pudding, which I found a bit too dense and soggy. On top of great food, amazing ambiance and impeccable service, we were also happy to have been able to knock off $50 from the bill thanks to my OpenTable Spotlight deal! Though the menu is a bit on the pricey side, at least for our budgets, and not a place for regular indulgence - we're thrilled to have this fine dining option in the valley! All in all, a great and masterful addition to the neighborhood. I have a feeling with Exec Chef Adam Horton at the helm, Raphael's bond with the community of SFV and Greater LA will be one that stands the test of time. Yamashiro is one of those LA landmarks that I've somehow never made it to in my 15 years here. Though I'd heard of its legendary views in the hills above Hollywood, its prices were of an unreachable altitude for me as a student, and then when I started working there were so many other places which had more irresistible appeal to my inner foodie, and I had to pick and choose based on budget. 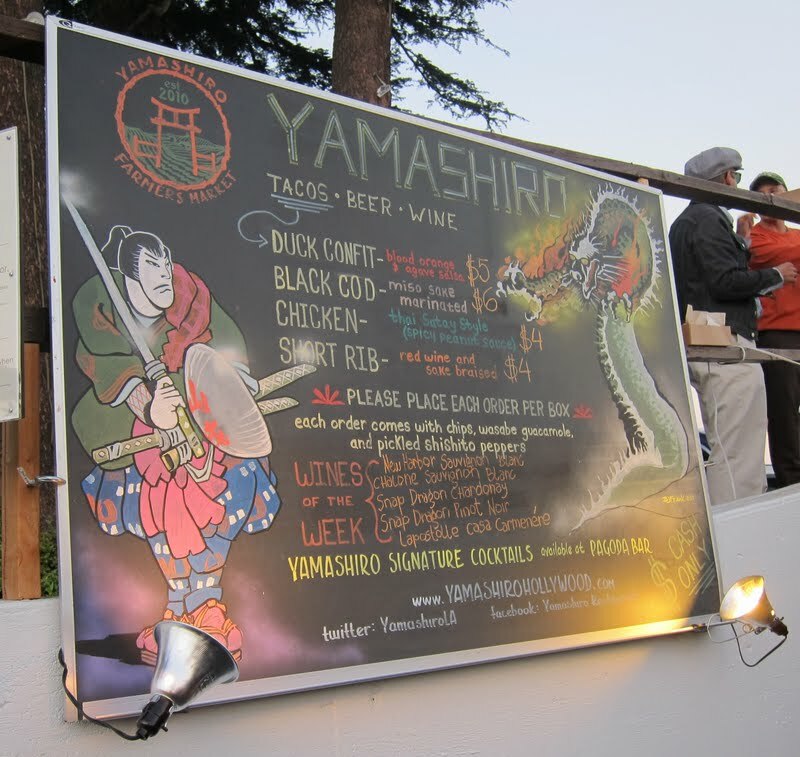 But I am a fan of farmers' markets, and when I found out about the one Yamashiro hosts Thursday nights (April to September) - albeit a year late, this is their second year - I invited 'Designer' to check it out with me. It's one of the few NIGHT markets - running 5-9pm, the timing is convenient for those who want to access fresh produce during the week but have day jobs (I have yet to make it to Santa Monica's Wednesday Farmers' Market). There's always the original Farmers' Market on 3rd and Fairfax, but strolling through the permanent structure just doesn't feel the same as your weekly 'event' markets. FREE parking and shuttle the word "Hollywood" usually conjures thoughts of "parking nightmare" - and Yamashiro is conscious of this as well as challenges with access to its hilltop location. So they offer free parking in a lot just off Hollywood and La Brea (at 7107 Hollywood Blvd), with free shuttle service up & down the hill. This past Thursday, the lot was full as I drove past, but I easily found meter parking a block south on La Brea (free after 6pm). It was then just a short walk to the lot to catch the shuttle. 'Designer' overheard the best description of the journey up the tree-lined, winding road to the market from a fellow rider - it felt like a 'field trip'! We loved the street / food fest vibe of the market - with its 20s/30s crowd milling about, getting wine & beer while perusing the produce and food offerings - bonding easily with strangers over their finds or shared seating at the makeshift tables and chairs lining the length of the terrace overlooking the city. We'd heard about the awesome food, with a well-curated collection of vendors and food trucks (including Heirloom LA and Coolhaus last Thursday!) but were most excited to try Yamashiro exec chef Brock Kleweno's offerings at street food prices. Yamashiro's Market Grill menu had us drooling on sight - it was all we could do to restrain ourselves from ordering the entire list! Since short rib is now ubiquitous though, we decided to go with the more unique sounding fusion tacos: Black Cod with miso sake marinade ($6) and Duck Confit with blood orange and agave salsa ($5). You could watch the chefs - including Chef Brock - prepare your food from the open grill at the tent. 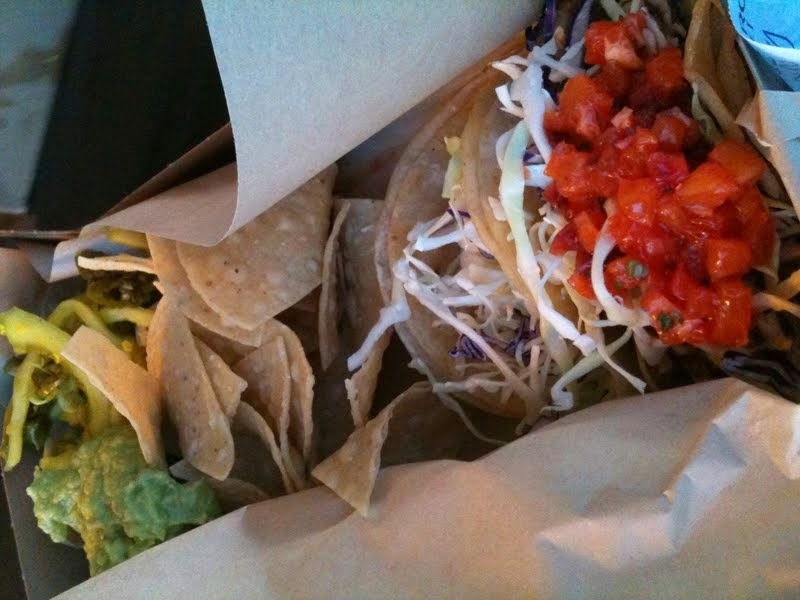 Both fusion tacos were amazing, tender, juicy and flavorful, each served with crazy addictive (and free!) sides of Wasabi Guacamole and Pickled Shishito Peppers. Easily my favorite fusion street tacos. I LOVED the wasabi guacamole while Designer was a huge fan of the peppers. We could have had a meal just of these! We hustled back to the taco stand before they closed for second rounds of the cod tacos, and when I told Chef Brock how much I loved the guac he was nice enough to give us extra dollops! Had the guac been for sale I would have bought a bucket full - and was thrilled when Chef Brock said they are thinking about starting to offer it for sale!!!! We were so obsessed with Yamashiro's food that we didn't really get to peruse of the other stalls after we started in on the food - but they had some fun ones from jewelry to loofah vendors. Which brings me to the other cool thing about Yamashiro Farmers' Market - the element of the unexpected. That day they had tweeted an invite for people to "check out the Wolves" and to "Hang out with them above the Pagoda Bar". I and some other folks at the market thought they were talking about a live band. When we found out they meant actual, live animals we could pet and play with in the terraces above the market, we had to make a stop there! Though we weren't entirely sure of the thematic connection...could it be to spark thoughts of being "hungry like a wolf"?...it was for a good cause, their special appearance was in support of a wolf sanctuary to raise awareness and funds. And I had been trying to train myself recently to stop looking for reason and logic in everything, to stop living in my head so much and just to go with the flow - live in the present to enjoy it. This was one great example of that. 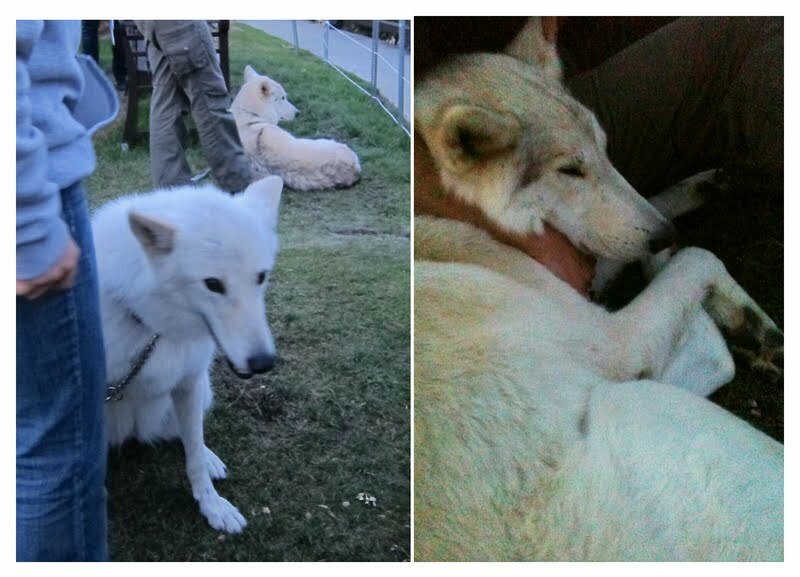 The wolves were beautiful, gentle and adorable. One sleepyhead snuggled against its trainer, while another named "Maya" was at first shy, but when encouraged by her trainer turned friendly and came up to us for head rubs. We had a fab time playing with and taking pics of the wolves, who were sweet as puppies - loved them! And last but not least, Yamashiro ("Mountain Palace" in Japanese) is known for its spectacular views, which didn't disappoint. We sat down at the benches to admire the view at dusk, with lights glowing from buildings below. Couldn't believe it took us this long to 'discover' this place! Peaceful and relaxing, it almost felt like we were on vacation - though we should have brought warmer clothes as it got a bit cold once it started getting dark. With all the cool/fun stuff happening, I actually forgot about fruit / veggie shopping! D'oh! I do remember the prices, at quick glance, being comparable to other farmers' markets - a bucket of cherries for example was $5, same as at Studio City Farmers' Market. Before leaving (last shuttle leaves at 10pm) we wandered into the restaurant to check it out. Built by German brothers in 1914 as a private estate to house their finds from "the orient", which has since evolved to restaurant and public gardens - it definitely doesn't give off the same aura of authenticity (as much as you can get in LA) that Gonpachi boasts of in terms of architecture / decor / vibe, but if you take it for what it is - a historic tourist attraction, that does offer a very LA experience for those who want to sip asian-inspired cocktails with respectively themed names and typography, or enjoy CalAsian fare over amazing views, Yamashiro is a great venue for a night out with friends, private events, or a date depending on who you're with. 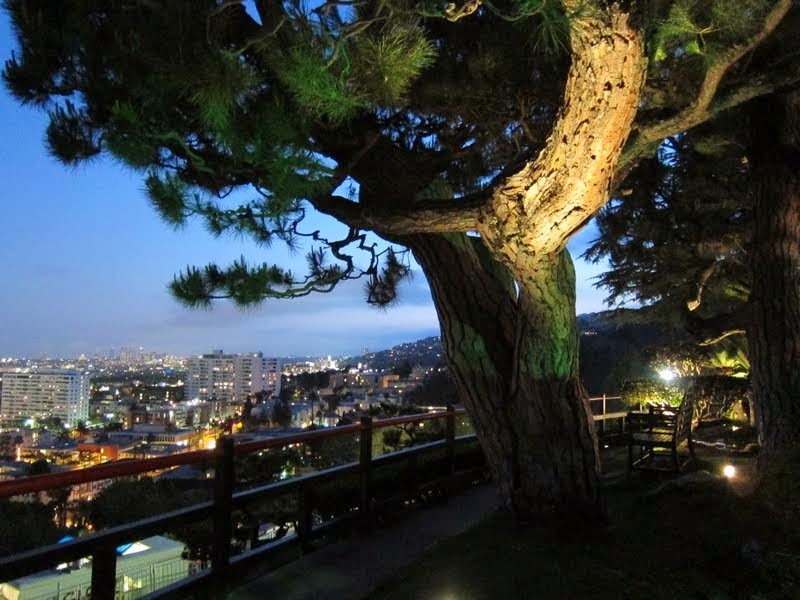 For those who want to experience Yamashiro without paying Michelin-star prices - Farmers' Market, which just got named one of the World's Top Night Markets by Travel+Leisure, is a must every Thursday 5-9pm now through September. 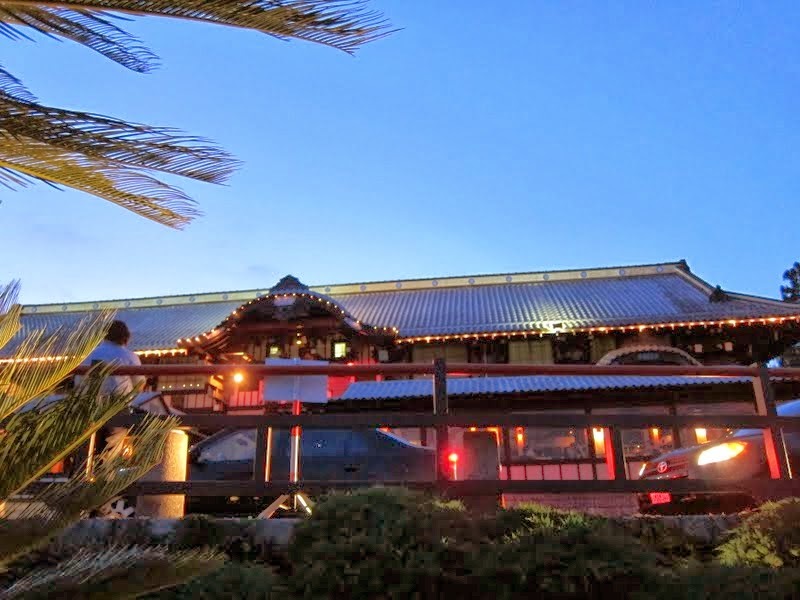 Be sure to stop by the ATM first though as the Yamashiro Market Grill is cash only. I know I'll definitely be back for those tacos and wasabi guac/or just for a refreshing local getaway for a few hours during the week! Parking: Free in lot at 7107 Hollywood Blvd, with free shuttle service to market. Also free meter parking after 6pm on La Brea. $5 for $10 ticket to Outdoor Cinema Food Fest - via LAWeekly VOICE Daily Deals (use by 9/3) less than 15 hours left to buy! Bloomspot Providence Giveaway - BEST prize ever!!! Enter for chance to win 14-course chef's menu with wine pairings for two to 2-Michelin starred Providence, helmed by Chef Michael Cimarusti!!! 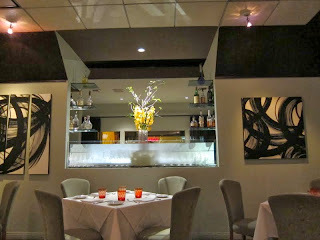 Providence is one of my favorite restaurants in L.A. - even though I'd only been there once before. You know how sometimes people say you meet the person you're meant to be with, and "you just know"? And then you think that's really annoying to hear, until you really experience it yourself? 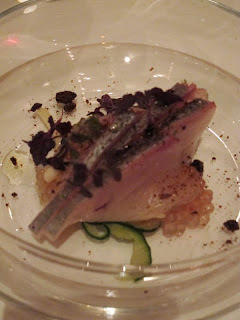 Well I'd experienced that with Providence - I loved everything about it immediately: the sophisticated yet soothing style, the lack of 'scene', utter focus on exquisite cuisine, plates the look of which set my heart racing - and took my breath away on contact - all came together perfectly for me. Though I've only ever been able to afford the 2-Michelin Starred restaurant once, I knew that it had taken hold of a part of me that can never been released to anyone else ever again. So, I was beyond excited when I learned of Providence's 5-course tasting menu, in celebration of its sixth anniversary - which was 'only' going to be $70 per person. I had gotten a chance to try Chef Cimarusti's various ingenious creations at other venues like LAWeekly's Gold Standard and Breadbar's Ibaraki Benefit, but hadn't had a chance to go back to his homebase on Melrose for a full-fledged meal. Last night, a 'normal' Sunday night for everyone else, a small group of us filed into Providence ready for the extraordinary. We were there to experience their 6th anniversary tasting menu, which began with two sets of amuse bouche: a mojito iced gelee with micro-mint, and a sphere containing a cocktail (screwdriver) that reminded me of The Bazaar's liquid olive in terms of preparation. Smart - bite-sized cocktails to kick off the meal. The second set of amuse consisted of a prawn, cheese puff and carrot soup in a shot glass. The near consensus at our table was that the second set of amuse was too salty, the prawn was just a touch overcooked with flavors that slightly overwhelmed the crustacean, masking its natural ocean-fresh sweetness. But these were amuse, and we were happy to get two sets of them 'gratis', so no complaints there! The first of five courses to arrive was the Japanese Kanpachi with original accompaniments of red shiso pearl tapioca, plus slivers of cucumber and enoki mushrooms. I loved the creative use of tapioca to evoke roe, served with the fish. The fish was incredibly fresh and loved the saltiness of the skin against the pristine, mild-flavored fish. 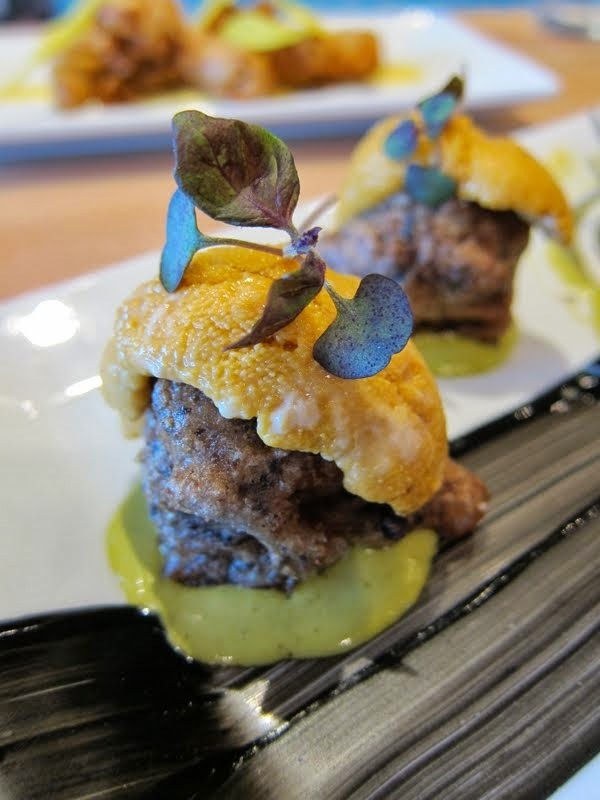 When a fellow diner at the table and I discovered that we both love uni, we decided to add a dish from the a la carte menu to our meal and split it - Santa Barbara's Finest. The description reminded me of the amazing creation that Chef Cimarusti served up at Breadbar's Ibaraki benefit, with the main difference being Santa Barbara spot prawns were used instead of geoduck clams, and gold leaf is added to this dish. Instead of a glass bowl, this time the dish was served up on a plate - but it was every bit as breath-takingly beautiful as the one from Breadbar. And every bit as mind-blowing in flavor and skillful interplay of creamy, silky and crunchy textures. Definitely a 'best-in-meal' that I hope they keep on the menu for a long time. Course #2 was Bobby's Block Island Scallops, which was incredibly tender and naturally sweet. 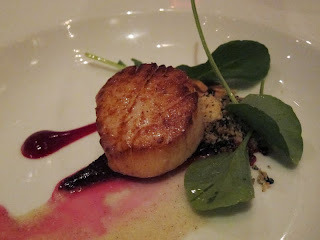 This also marked the first time I'd had scallop with (forono) beets - an interesting combination. The scallop was also accompanied by almonds, nori, and upland cress for visual and textural variety. Course #3: Wild Pacific Halibut (British Columbia) with a crust of smoked sesame seeds, and side of delta asparagus, sunchoke puree and preserved meyer lemon. The fish was so tender it fell away with a light flick of the fork, and the sesame seeds added a fragrant crunch. Loved the sunchoke puree, light and foamy, its savory flavors in combination with the citrus, deftly drawing out the natural, sweet flavors of the fish. Course #4: Marcho Farms Veal Tenderloin (Franconia, PA). Some of us preferred fish over meat, especially at a place like Providence that specialized in seafood! The staff was kind enough to accommodate our request for a substitution and gave the seafood-lovers sardine instead of veal. 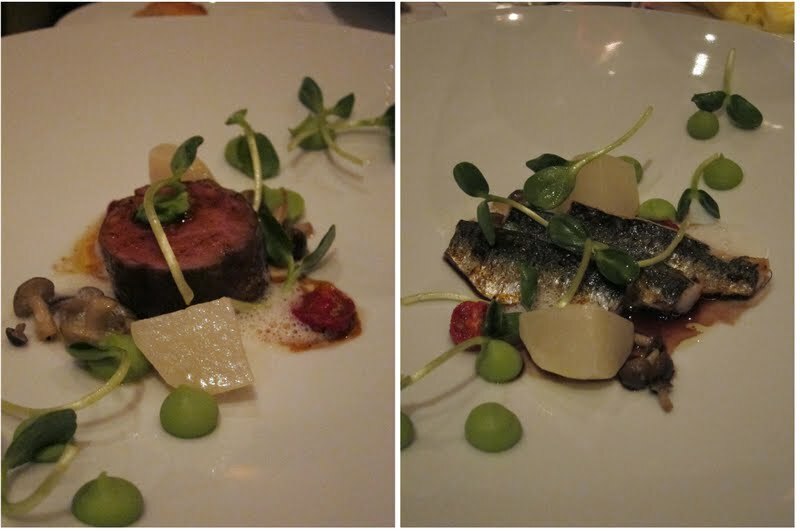 Both land and sea versions of this dish were cooked sous vide, and served with sweet pea puree, buna shimeji mushrooms, turnips, tomato confit. We actually got sort of sad when we realized this was the fourth and final savory course. If Groundhog Day were ever to happen as in the Bill Murray movie, I would want it to happen with tonight, so that I can relive this meal over and over. 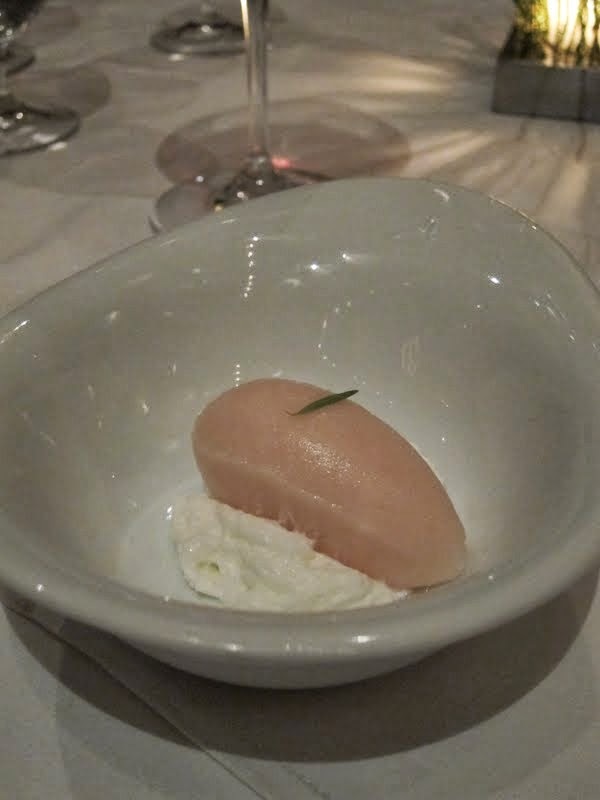 In between our last two courses, we were given a pink grapefruit sorbet and yogurt foam as 'palate cleanser'. The light, subtly tart sorbet was incredible when paired with the almost frothy, light yogurt foam. Our 5th and final course was dessert: Chocolate Cremeaux served with cherries compote, salt & pepper ice cream, port caramel, and what other diners described as 'cocoa puffs' for crunch. 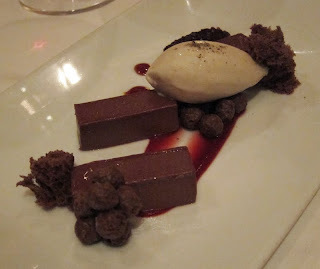 LOVED this dessert, which made me think of a deconstructed black forest cake. I loved that there were hand torn pieces of cake thrown in on each side as what seems like an after thought, versus going the traditional route of layering cream and other ingredients between layers of ccake. And we all talked about wanting to recreate the delicious salt & pepper ice cream. 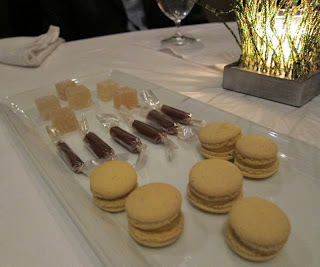 To finish out the meal, Providence provided a plate of mignardises - my favorite of these was the buttery soft caramels. All in all, another mind-blowing meal from the kitchens of a chef who is beyond compare. Counting a glass of wine that was $18, my personal total came to just under $100 - more than I would normally spend on a meal, but WELL worth it for this caliber of food from Cimarusti, who is absolute genius as far as I'm concerned. For those who want to check out the place / capitalize on the deal - the $70 prix fixe meal goes through the end of June (dinner only). There hasn't been a more exciting time for L.A. food-lovers - it seems every week a new, inspired restaurant blossoms and joins the bountiful field. It's almost too much to try to keep up - the minute I put pen to paper for a list of places I want to try, it's already outdated. I LOVE the sheer number of choices on any given day in LA - and often fantasized about winning the lottery and quitting my job so that I could dedicate my days to trying every last one. But every so often I do want to step away from the wishlist (wish being the operative word! ), the email alerts and the herds and just go with the flow. So it was last week when my friend 'Designer' waved her Travelzoo certificate to Drago Ristorante, that I found myself very excited to check out a place that though long lauded as one of the top Italian places in the city, is an absolute dinosaur by LA dining scene standards. Drago Centro, the shinier, newer space in the same restaurant group, located in downtown LA - was on my list to try both for its inventive menu and all day Happy Hour. But I was intrigued by the idea of going to a place that I had driven past for the past 15 years and somehow never experienced; of seeing the earlier beginnings of Chef Celestino Drago's empire; and irresistibly lured by Travelzoo, which had made us an offer we couldn't refuse: $30 for a $60 3-course meal for two, plus 25% off a bottle of wine. Just outside downtown Santa Monica, on a stretch of Wilshire that can be seen as thoroughfare to Brentwood - with L.A. car culture and its laser focus on getting from point A to point B - you could easily miss Drago if not specifically looking for it. And I had - for 15 years it barely registered on accidental glances out of the corner of my eye, while driving through the area. Despite the initially intimidating, cold hues in the restaurant's decor, we were given a warm friendly greeting before being seated in the cozy back dining room. The best part of this Travelzoo deal is that you can choose from the main menu within each of the three courses, and we dove right in. After placing our orders, we received a plate of Arancini as amuse bouche. 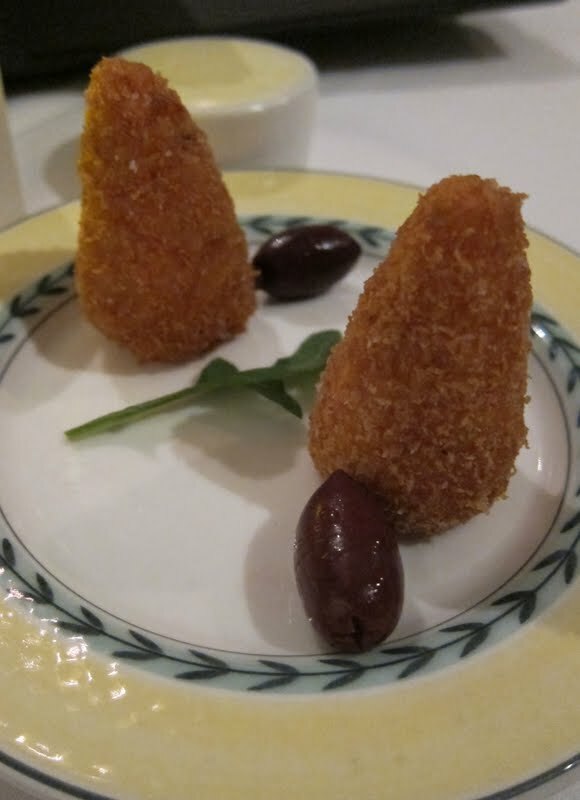 This was an interesting as it was cone-shaped, versus the more traditional sphere, the rice inside was cooked in some tomato-based broth, and they were served with olives. A lovely way to kick-off the meal! 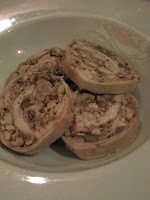 For my starter, I had the Involtino di Coniglio ($14) rabbit roulade, fava beans, carrots, oregano. A friend had named her pet bunnies Fifi and Moomoo Coniglio, which I only thought of as adding to their charisma - but never realized that "coniglio" was simply Italian for rabbit til now. So I did feel a bit guilty digging into this dish - but I can't resist the out of ordinary, and this one almost literally jumped off the menu at me. Though I found the meat a bit dry, it was to me a creative and flavorful preparation. And I liked the touch of tongue-in-cheek humor, that belies the slightly austere vibe of the main dining room, pairing rabbit with carrots (serving my food with their food - circle of life on one plate). Designer went with the Insalata di Barbabietole e Burrata ($13) to start, composed of burrata, market beets, arugula, pistachio, fried shallot. 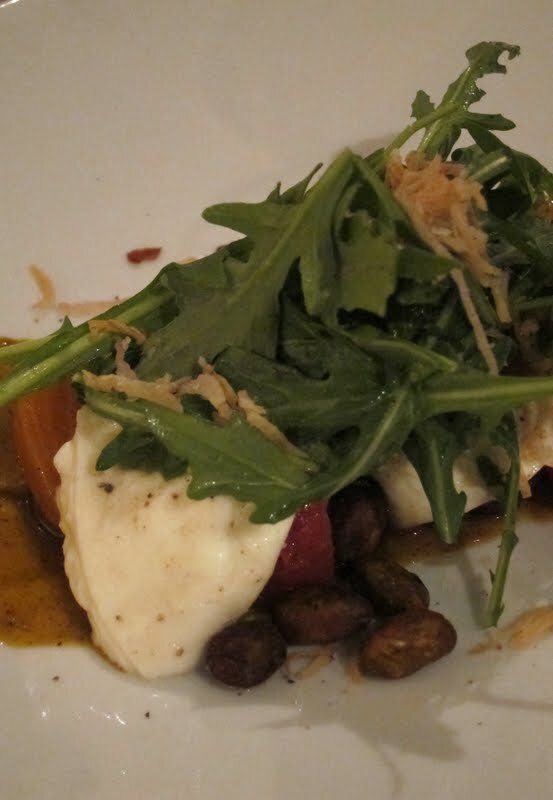 The burrata was creamy and rich, melding nicely with the colors and textures of the other ingredients in the salad - but of course nothing compares to the quality and taste of the fresh, handmade burrata at my fav Osteria Mozza! 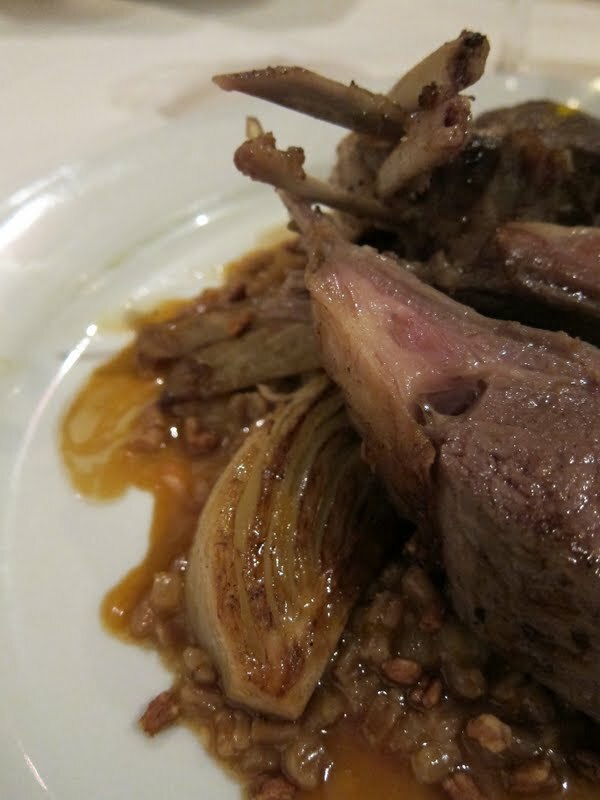 My main: Costolette D'agnello ($28) oven roasted lamb rack, sous-vide fennel, farro, orange demi. For some reason, I was in the mood for devouring small animals that evening - so I followed rabbit with lamb. This may have easily been the best lamb I'd had this year - cooked 'medium', it was so tender and almost buttery that I let out an audible sigh. It was beautifully and subtly gamey, incredibly juicy and perfectly counterbalanced by the citrus infused farro for nice textural contrast. The sous-vide fennel was also amazing, with layers that resembled caramelized onion nearly melting away in your mouth on contact - and rich anise-like flavor. The portion was so generous I ended up with lunch-sized leftovers - which was just as delicious the next day. 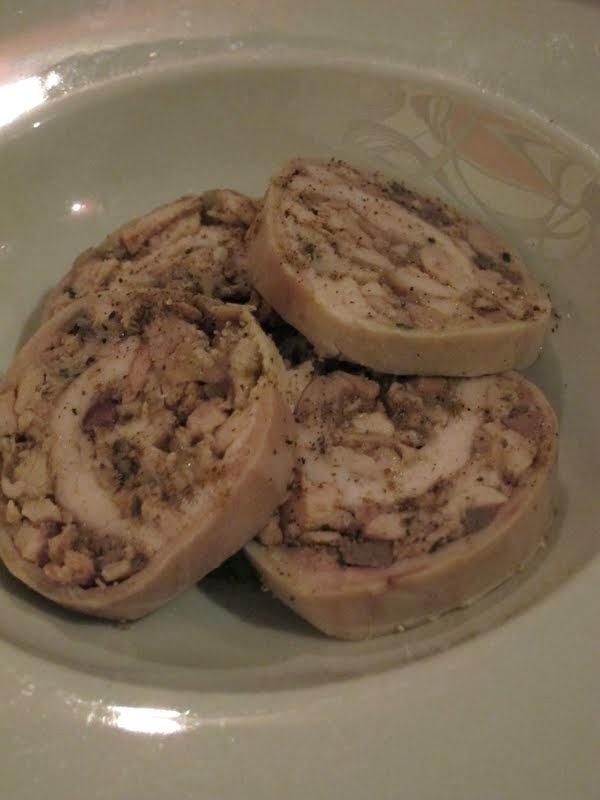 This dish made me wish I had a puppy - with the intoxicating flavors soaked to the marrow, I could imagine a small dog going to town on whatever microscopic morsels of meat I may have left un-emasculated on the bones. 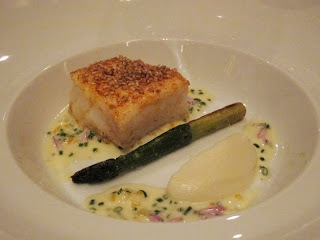 Designer was drawn to the oven roasted sturgeon, cauliflower, spinach. 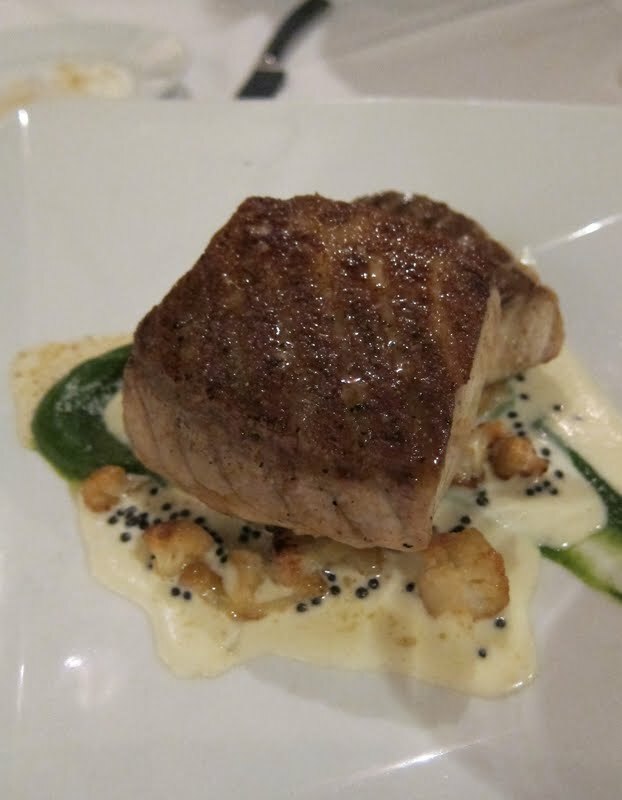 This was also great, with nicely crisped, salty skin taut over velvety fish, well balanced by roasted cauliflower for texture contrast, ribbon of spinach puree for pop of color, and laying on a lake of sauce made of creme fraiche and caviar!!! I died a little at the table, but Designer didn't love it. Neither of us are wine connoisseurs, but with the 25% off deal we had decided to go with a Cinque Terre (Designer was delighted to see this on the list, as she had just visited the region last year and was sad that she didn't bring back more bottles, since it is so hard to find in LA). The bright, refreshing wine went really well with the fish - and we loved that the bottle ended up costing probably around the same as two glasses would. We struggled to find room for dessert, but couldn't let the last course in the Travelzoo deal go to waste! 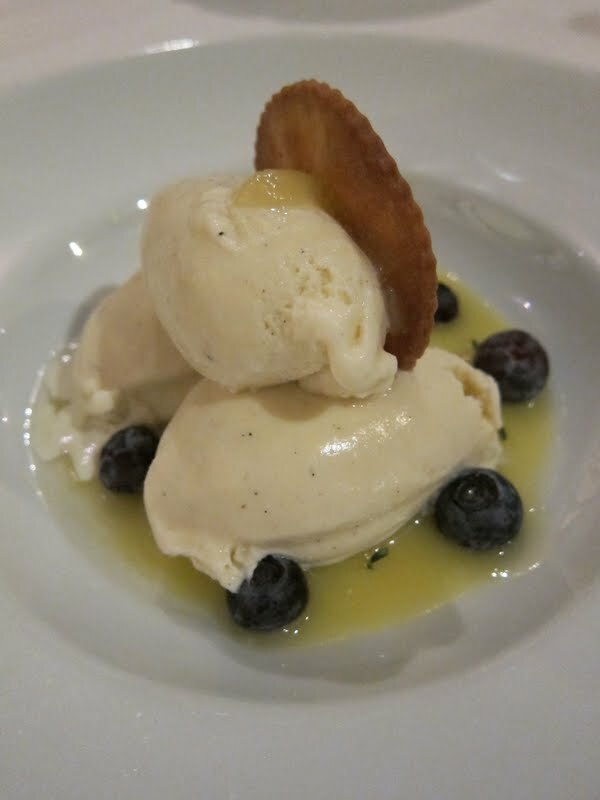 Looking for a light finish, I went for the Coppa di Limone ($8) which was supposed to be made with mascarpone gelato, but was substituted with vanilla as they had run out that night, vanilla shortbread, meyer lemon curd, and blueberries. The citrus cut through the mild vanilla flavor of the gelato nicely and gave the refreshing last bites I was looking for - but wasn't spectacular, and I thought it could have been improved with blueberries that tasted more farmer's market fresh. 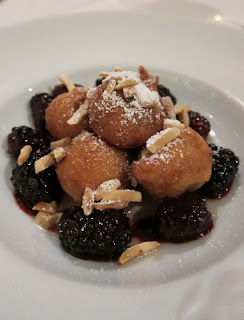 Designer went for the Zeppole ($8) of honey glazed fritters, toasted almonds, blackberry compote. These were like small donuts, fresh out of the oven, with berry and nut toppings. I wished we had more room so we could finish this one off - though again the berries tasted as if store bought and not as flavorful as ones I could get from the farmer's market. All in all, an incredible deal at what came out to $15 per person (before tax & tip) for food, and under $35 for the bottle of wine. The staff was also very warm and much more hospitable than I expected for a fine dining spot - we had such a great time we ended up closing out the place, and they never rushed us or treated us differently because we were using a deal. Can't believe that all this time I had just driven by and that it took this long for us to experience Drago - like Serendipity, it felt a little like we were meant to be here, and glad that we were finally drawn to the right place. Though not all the dishes were mind-blowing, the mains we had I thought were incredible - and it was good to see that the prices on the regular menu aren't as high as I originally expected. I had also enjoyed Chef Drago's other venture, Enoteca Drago in Beverly Hills, and am looking forward to checking out Drago Centro at some point. But in the meantime, I can see the reason for Drago's staying power - it's been around for what seems like an eternity on the LA dining scene. Would come back another time when I'm in the neighborhood - and hopefully next time it will not take another decade and a half! 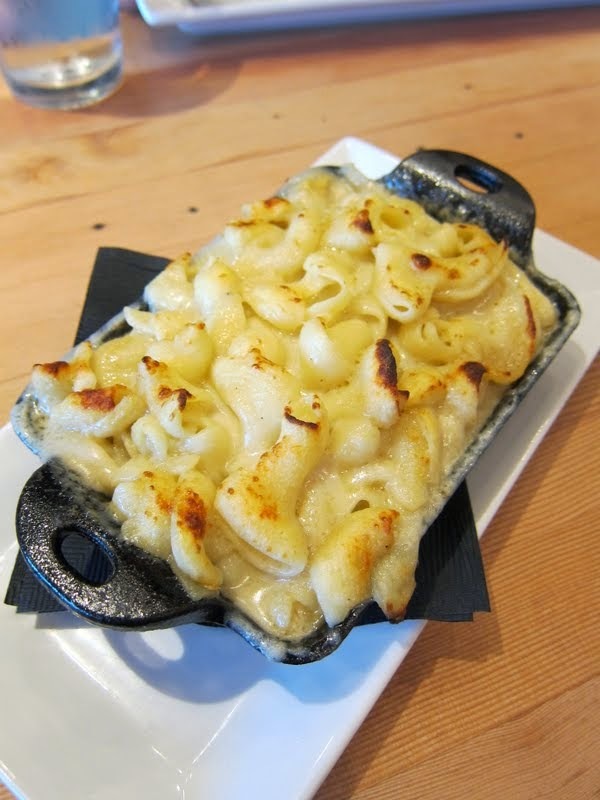 Firenze Osteria - two deals! Weekdays: "Under 10" Lunch Menu Firenze Osteria - lunchtime only, dishes on special menu all under $10 each!! Best gourmet deal in Burbank/Toluca Lake/Studio City area! (At Top Chef Fabio Viviani's restaurant!) Menu changes regularly - you need to ask for the "Under 10" lunch menu - they don't automatically give it to you. Alaskan Airlines Travel Like a Rock Star Sweepstakes - Win concert tickets for 4 to a select Live Nation concert, fly to that city first class, and get accommodations for 2 nights (ends 8/22/11 11:59pm PT) Official rules on same page. Imagine some of your favorite lesser known, local food producers and neighborhood market / restaurant finds, gathered in their very own permanent place, steps away from the ocean. That is The Market at Santa Monica Place - a well curated collection of artisans bringing their passion projects to the fore. Kind of defying the concept of artisanal, by being placed at the top of a high profile luxury shopping complex - but somehow it works. I love a great underdog story, and it's like the underdogs have made it, finally getting the recognition they deserve with a platform to broaden their reach to a more mainstream audience - both of their wares, and of the larger message that local, sustainable, handcrafted is in demand, and has 'arrived'. Soaring almost literally over the heads of 800lb gorilla chains, and a tendency for mass consumption of goods of the lowest common denominator. And foodies everywhere across the city are cheering them on. 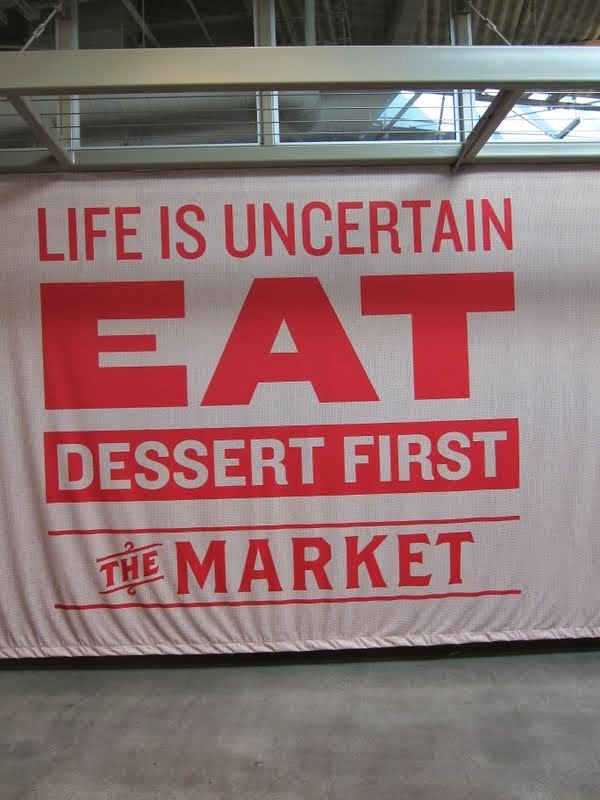 Much comparisan has been drawn of The Market to San Francisco's Ferry Building Marketplace - while the concept is similar, I feel the vibe and offerings differ a bit. Ferry Building caters in general to a more upscale, sophisticated crowd, with creme de la creme artisanal offerings from traditional teahouse service of exquisite hand-picked teas, to exotic mushrooms/truffles to pristine oysters, delicate desserts, cheeses and wines, while managing to avoid any feeling of elitism. The Market has a more whimsical side befitting its more casual beach-going / La La Land drawn crowd, with a retro-cool ice cream purveyor whose marketing hook involves servers 'in character' as 50s pin-ups being one of the first 'stalls' you see - and signs like the one pictured at left emblazoned with fun foodie philosophy / catchy food-inspired one-liners adorning its walls. 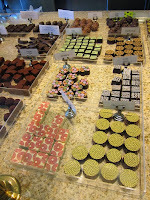 Holding to the philosophy of 'dessert first' - sweets are truly what you will see first when you enter The Market. To the right inside the entrance, next to Beachy Cream ice cream, you will be greeted by Rockenwagner, another dessert purveyor (ok, baked goods but predominantly sweet ones) with a sense of humor and touch of Hollywood. 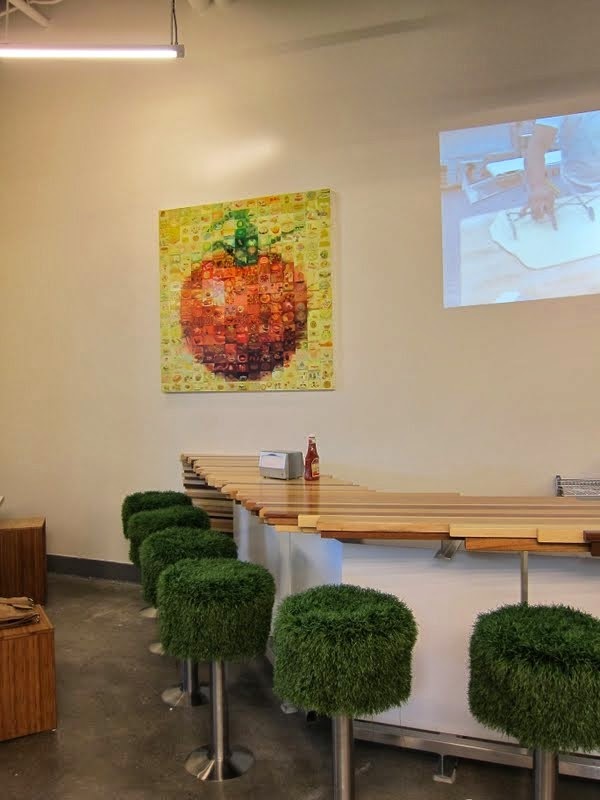 I would describe their decor as understated whimsy - overall the space has a clean, streamlined look, but is embellished with unexpected pieces from faux grass-covered seats to a tomato mosaic wall hanging that on closer inspection is made of stylized images of LA icons including Bob's Big Boy. A mannequin is dressed with an outfit made of chocolate covered pretzels; a table display is adorned with lawn gnomes. Rockenwagner's specialty is their made-to-order, from scratch, souffles. I tried the passion fruit w/ honey-orange ricotta 'dip' - it was not as great as I expected, a little too light and foamy and single note in flavor. They also offer various pastries, and a few token savories like sliders and paninis. Moving down the row, there is a coffee/tea place and stall with 'farm-sourced' organic skin care (Benedetta is actually also in the Ferry Building!) and Magical Blooms for breath-taking floral arrangements, before hitting you with more sweets (love it!). One that I am glad to see at The Market is L'Artisan du Chocolat, easier and more central for me to get to now than their Silverlake boutique (in terms of having other stores around, so I can make an afternoon of a trip to The Market, after the beach or shopping, versus having to drive out to Silverlake specifically just for my chocolate fix). Love their hand-painted chocolates with wide range of flavors from matcha to mango-wasabi to bacon to shitake and korean garlic (flavors available vary). 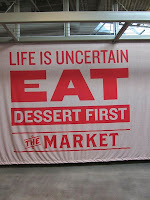 There is also a trio of Italian eats under the banners of Primi al Mercato and Norcino Salumeria. Primi al Mercato is in two parts - on one side, you can buy everything you need to make great pasta dishes at home, from fresh semolina pasta handmade on the premises (you can watch the lady making it at the marble counter at the window, if you go early enough in the day!) priced by the pound, to jars of the best sauces Italy has to offer. In their words, the fresh pasta is 'life-changing' - after trying their fresh ricotta-filled semolina gnocchi ($5/lb) with San Giuliano pesto-basil sauce, I would agree. I am now ruined for home-cooked pasta - once you go fresh you'll find it very hard to go back to dried! 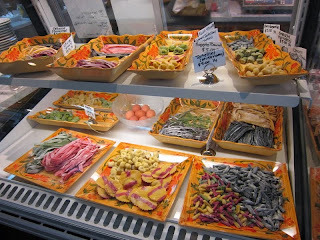 Plus, they make harder to find pastas like squid ink fettucini. 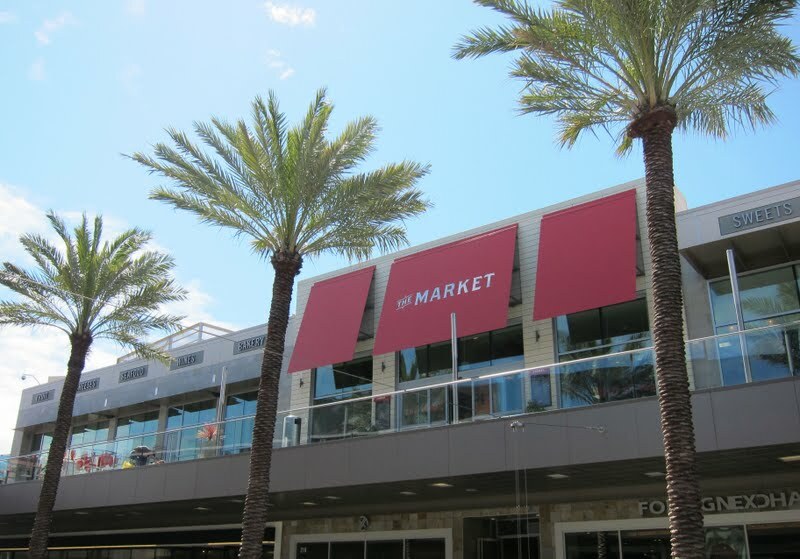 Those who can't wait til they get home, or aren't in the mood to cook, can taste Primi al Mercato's pastas right at The Market in their adjacent restaurant. 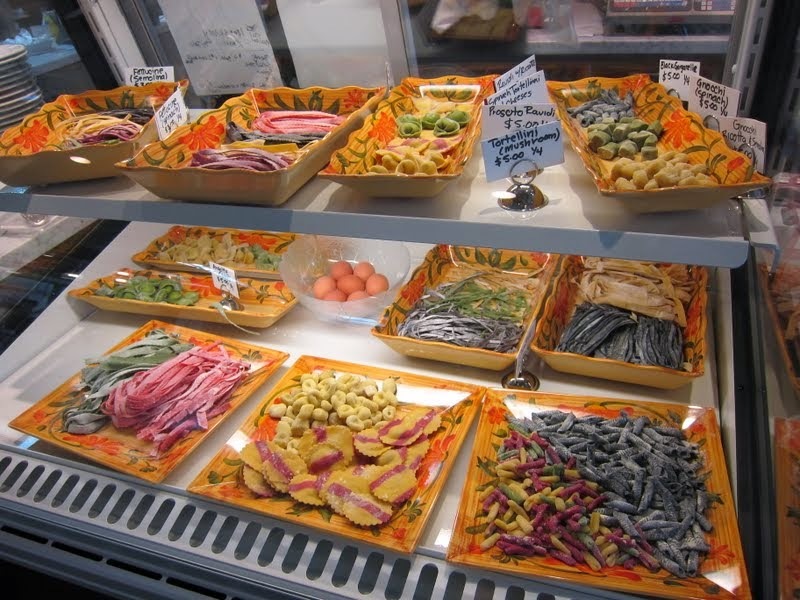 Norcino Salumeria, across the way, offers case upon refrigerated case of beautiful charcuterie and cheeses. You can try their cheese plate (any 3 cheeses from menu for $12, add $5 for glass of wine) at the bar, or sit in the deli to enjoy a panini made with their finest selection of cured meats. I was delighted to see that they carry Sottocenere, one of my favorite cheeses laced with black truffle, swaddled in a beautiful edible grey vegetable ash rind - though the going rate was $35/lb there. At the far end of The Market is Venokado, a wine & modern gifts market (that carries SQIRL jams and Bakelab treats! As well as wine paraphernalia, wine country inspired soaps etc.) and The Gourmandaise School which offers hands-on classes in their open kitchen-lab right in The Market! Last but definitely not least, in the far corner is the restaurant that had me screeching to full stop the minute I spotted their blackboard specials. 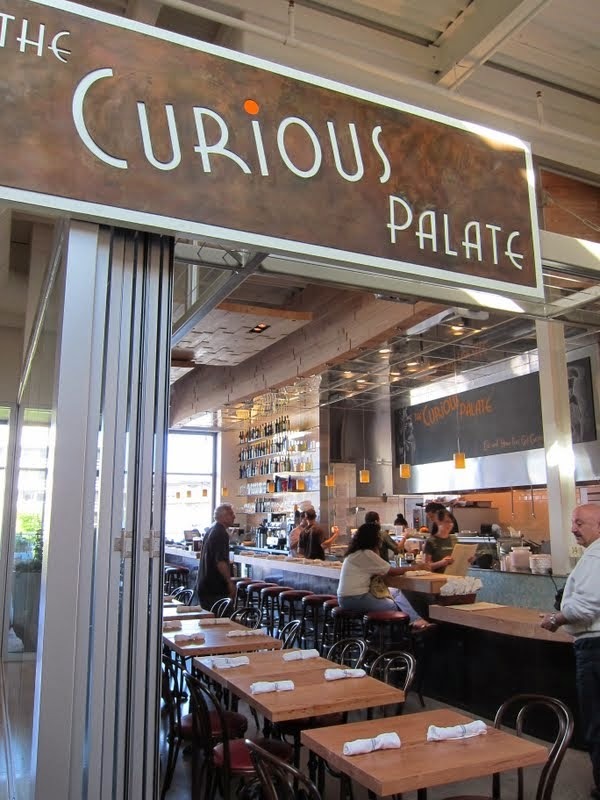 The Curious Palate actually has a location in Mar Vista, close to the farmer's market (they specialize in farm-to-table cooking), but is making its debut in the higher profile SM space here. 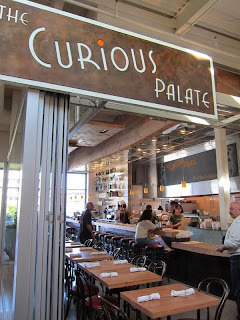 I loved the casual counter space with full view into the open kitchen, as well as their narrow strip of, but lovely, outdoor terrace seating that allows diners to enjoy the gorgeous SoCal summer / sea-air. But it was the menu that really captured my attention - some of the magic words were "Black Rice Beignets with Santa Monica Sea Urchin" and "Lamb Sweetbreads". So we had no choice but to stop in for a bite. Sliding up to the long wooden counter - my first order of business was Black Rice Beignets with Santa Monica Sea Urchin ($14) seasoned with black olive salt and salmoriglio aioli. 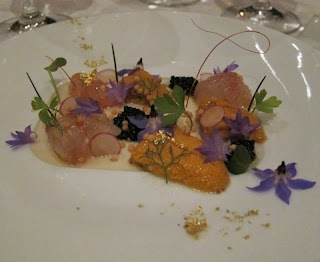 I loved the creativity of this dish - substituting the toothsome black rice beignets for the usual round of sushi rice under the pieces of uni that tasted like it was plucked from the ocean just minutes before (quality of both the sea urchin and the plating /presentation was unexpectedly high for mall dining!). There were four beignets for $14, a fairly good deal for a dish involving uni! 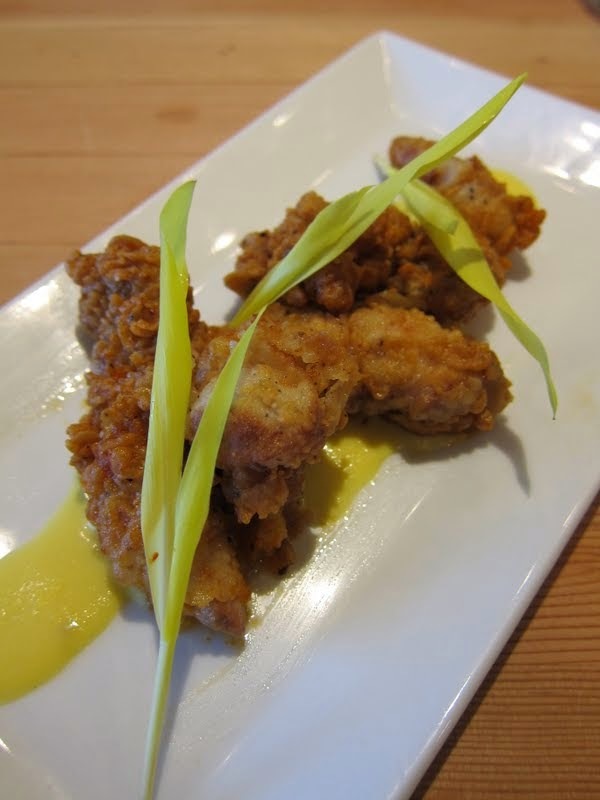 Next up were Lamb Sweetbreads ($12) with corn pudding, fresh herbs and meyer lemon. I also loved this dish, which was juicy, perfectly cooked so that the lightly crisped shell yields to a chewy but not tough interior, and packed with earthy and subtly sweet flavors. I hope they keep this on the menu as I would definitely come back for it. We actually had dinner reservations at Drago later that night so I wasn't supposed to fill up at The Curious Palate, but couldn't help myself! My friend 'Designer' was with me, but not feeling the same bottomless hunger that is my constant companion, so she opted for the small plate of Macaroni and Cheese ($8). This was a good enough dish, with light creamy cheese and a lovely crusted top - but otherwise overshadowed by the other amazing dishes. Perhaps I wasn't as subtle as I would have liked with the food paparazzi shots, but without us ever at all mentioning the blog, our super friendly server surprised us with a dish 'on the house' near the end of our meal: Razor Clams - ceviche, leche de tigre ($10). This was beautifully presented in a glass jar with a side of plantain chips. The citrus and onion flavors were skillfully controlled so as to neatly cut through the shellfish, while not overwhelm it at the same time - so that the freshness of the clams were highlighted, not covered, by the marinade. 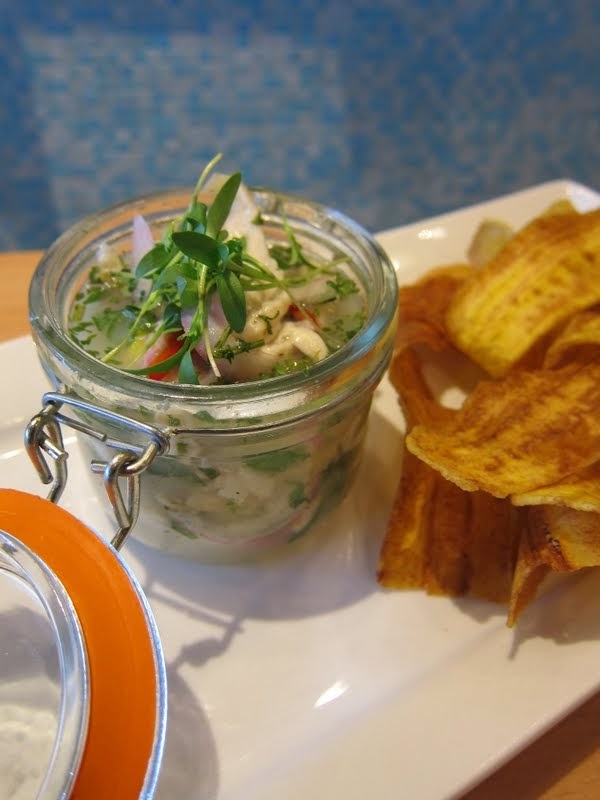 I loved the smooth slivers of clams, which offered a nice chew counterbalanced by the crisp and fruity crunch of the plantain chips. Loved this dish and would defnitely order it again the next time we're back. All in all, so happy to have this exciting new waystation for affordable gourmet in the midst of the somewhat overpriced dining terrace offerings at Santa Monica Place. And so glad that I can now pick up my favorite foods for easy weeknight meals, as an easy stop on the way back from the beach, at The Market. All this gorging and I can feel good about it, afterall, I would be supporting local artisans in their sustainable food efforts, even if I'm buying the gourmet goods at the mall.